Dreamer remains hopeful for naturalization against all odds. The typical American high school senior is one that is well rounded. They participate extracurricular activities. They tailgate on Fridays. They are hardworking, active in their school and socially advanced. And when the time comes, they apply for higher education. Emilio Villafana was one of those American high school seniors, until he found out he wasn’t. “I thought I was an American until high school came around and my friends started getting jobs and licenses. I didn’t have a Social Security card or a birth certificate or anything that would allow me to get these things. That’s when I started to see a tangible difference between me and everyone else,” Villafana said. Villafana was born in Trinidad and Tobago and moved to the United States when he was one years old. Student visas allowed his parents entry to the U.S. Their visas expired but they decided to stay in the U.S. to give Villafana and their family a better life. “I’ve never known Trinidad. I left when I was a baby. I only know America, I have an American perspective on the world,” Villafana said. He grew up like a regular American kid. He participated in sports and attended the American school system from kindergarten. When he could not obtain a driver’s license in high school he could not obtain a driver’s license after realizing he did not own a social security card. In his search to obtain one, it finally sinked in that he was in fact not a documented American citizen. When the time came, he applied to Kennesaw State University, was accepted and began to make plans to attend against all odds. However, his citizenship status does not qualify him for any federal benefits, including financial aid and in-state tuition. He was forced to withdraw because he says it wasn’t the best choice financially. “I always knew that my parents were constantly trying to gain citizenship because it was something my om talked about often, but I never really thought about how my status would affect me until I was faced with these new obstacles,” Villafana said. According to the Pew Research Center, undocumented immigrants are parents to 7 percent of K-12 students. After a series of paperwork, interviews and being in the U.S. for over 10 years, Villafana mom was able to gain citizenship. This was a turning point for their family and Villafana knew he could now gain citizenship through naturalization. But the process would not be easy. During Villafana quest for citizenship, the process proved to be tedious and costly. His dad lost his job and was out of work for over five years so his family was tight on money. He and his mom tried to do the paperwork herself but there were often mistakes that Homeland Security refused to look over. “Not only was she propping up a family of three kids and a husband, she had to work to live. There wasn’t a lot of money available for filing fees. I still had plans to go to college though. And then she was diagnosed with stage four breast cancer,” Villafana said. After the death of his mother, Villafana petition to gain citizenship was voided. Convinced there was still hope for his petition, a family member took him to a lawyer who said he would help Villafana enroll in Obama’s Deferred Action for Childhood Arrivals (DACA) program which gives unauthorized immigrants who came to the U.S. before age 16 a chance to stay in the U.S. In 2013, He was able to apply for DACA but the process has taken longer than expected. Maintaining these requirements has been hard for Villafana. He is currently without a stable shelter and this has often interfered with his employment status. He has been couchsurfing for months and recently took the blow of having his DACA papers returned. In September, Attorney General Jeff Sessions announced that the Trump administration will end protection from deportation for approximately 800,000 young Dreamers. 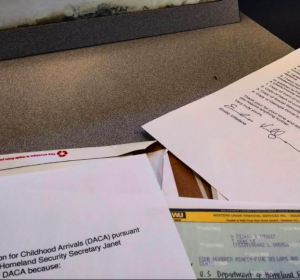 A recent decision was made to allow DACA renewals again and the deadline approached quickly. Villafana was able to beat the deadline by two days. “The paperwork was sent back and I’ve been in limbo for the last few months,” Villafana said. He is now raising money for his petition fees. If Villafana can manage to get his petition in time, he will have a chance at getting the most stable legal status he has had his entire life and can continue to build his way towards naturalization. Alicia on When Fourth Ward Grew Old: A discussion on gentrification focusing on one of Atlanta’s most famous historic neighborhoods.